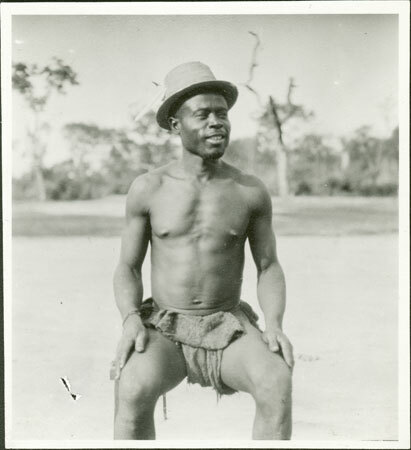 A portrait of a seated man (identified as Sanduke, a subject of Badinda, who was probably a local governor) wearing a feathered straw hat, his face a half-turn away from the camera. Notes on print/mount - "[illegible] C. R. Badindas EPA 463 AI/6"
Notes on card mount m/s pencil - "hole l.lh 6/87"
Morton, Chris. "Portrait of a Zande man" Southern Sudan Project (in development). 03 Jan. 2006. Pitt Rivers Museum. <http://southernsudan.prm.ox.ac.uk/details/1998.341.463.2/>.